“Rose with Stem” is stamped with black ink on white card stock, masked and “Leafy Branch, Sm.” is stamped in green ink so that the leaves appear to be behind the rose. The rose is colored with markers. 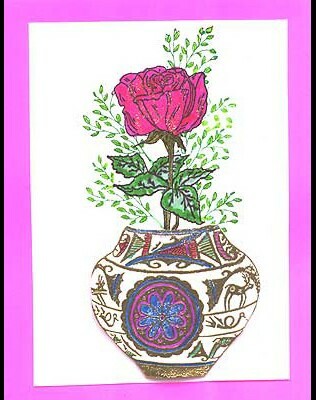 “Zuni Pot, Lg.” is gold embossed on white card stock, colored, cut out and foam mounted below the rose. The white card stock is layered on pink card stock. Glitter is added to the rose and portions of the pot. Card by Merci Crosskill. Tags: Foam tape, Glitter, Leafy Branch Sm., Markers, Masking, Merci Crosskill, Rose with Stem, Zuni Pot Lg.